Myth 1. Iron plate can provoke an explosion. As a matter of fact, hyperfrequency waves that form the basis of microwave oven’s work, are possessed of a quiet low power. In consequence of heating-up such metal covers like knifes, forks and plates, only sparks can occur. This may cause the breakdown of the unit itself, but not an explosion. Therefore, to avoid the failure, it is not recommended to use metal covers while warming up. The main task of a microwave oven is the heat up products. As consequence, some nutrients and vitamins can really evaporate or dissolve, as well as during other types of cooking (frying, stewing, boiling, etc.). All nutrients and vitamins can be preserved only in fresh products and microwave oven has nothing to do with that. Various “horror stories” about gene mutation and cancerous diseases, that disturbed users do like to spread, are pure inventions. Microwave ovens don’t change the molecular structure of products, what makes it impossible to provide such radical influence on human body. Myth 3. Microwave oven’s emission affects human body; it is dangerous to come up to a running unit. Hyperfrequency waves are less harmful than X-Rays or gamma radiation. By impact on human body microwave ovens are equaled to mobile phones. However microwave cookers also have a special “cover” that blocks all possible effects of SHF-rays (superhigh frequency rays). As carried out tests show, negative influence on human body is possible only if a person spends 8 hours a day, at the distance of 2 inches from a running microwave during 3-5 years. It is doubtful whether you are used to spend leisure this way, so you can feel absolutely safe. Myth 4. Products are heated up from the inside. It is widely believed that a microwave oven heats up food “inside-out”. As a matter of fact hyperfrequency waves act outside-in and they “work” in the upper layers of food, at the depth of about 0.39 – 1.18 inches. The warming-up of products is realized through dipole molecules’ (molecules of water, sugar, fats, etc.) motion and heat that is developed during this motion. Microwaves don’t react on dry materials that often cover goods and that’s exactly why crescent roll is warmed up from the inside – from wet to dry. Myth 5. If a microwave oven is left turned on for too long, all electric appliances in the house will fail to function. Here we deal with exaggeration of microwave oven’s capacities again. In fact a standard cooker is built in such a way that its rays have an effect only on a product that is inside and they don’t constitute any danger. However if there are any damages in tightness, then, theoretically, rays can spread outside of the unit. Nevertheless a microwave oven with such breakage won’t start and, thus, rays won’t be distributed. Myth 6. 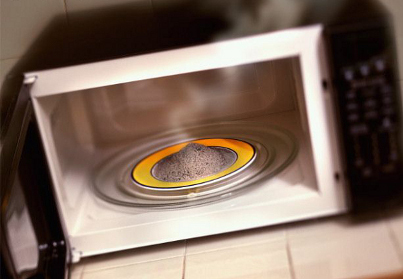 Eggs can’t be cooked in a microwave, because this lead to the products’ explosion. Indeed, when you heat up products, molecules expand, what may cause egg’s shell damage and, as a result, an explosion. Similar effect can be observed with sausages in vacuum package. These given “explosions” are fraught with additional oven’s cleaning only, but they don’t constitute any danger to people. What myths do You know?